A male rusty-patched bumble bee resting on a joe pye weed in early morning at the Curtis Prairie, University of Wisconsin-Madison Arboretum, Madison, Wisconsin. University of Virginia biologist T'ai Roulston discovered a lone rusty-patched bumble bee worker at Sky Meadows State Park in 2014. Attempts to find another individual in this area have, so far, been unsuccessful. Rich Hatfield, a bumble bee expert from the Xerces Society for Invertebrate Conservation, has been a champion for the protection of the Rusty-patched bumble bee. After advocating for the species for years. Rich saw his first live rusty-patched at the University of Wisconsin-Madison Arboretum during the filming of A Ghost of the Making. A male rusty-patched bumble bee resting on a hyssop in early morning at the Curtis Prairie, University of Wisconsin-Madison Arboretum, Madison, Wisconsin. 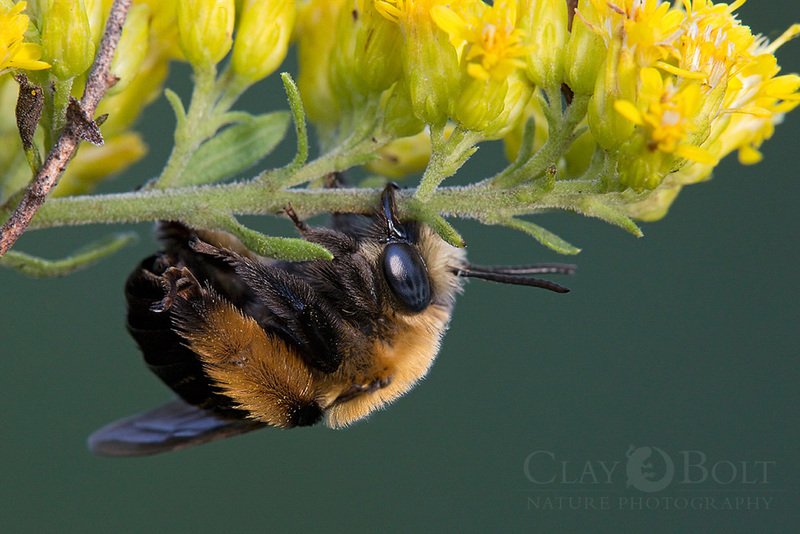 The first rusty-patched bumble bee that photographer Clay Bolt encountered. 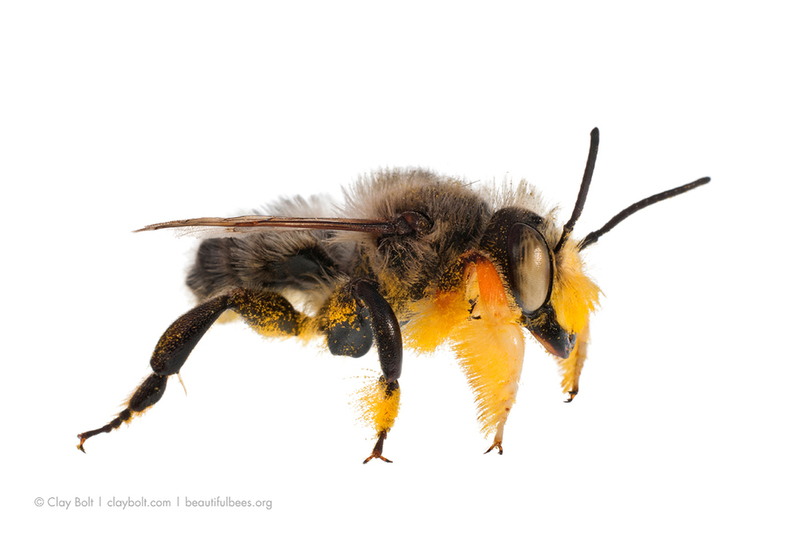 This specimen, preserved at Great Smoky Mountains National Park, inspired Clay to undertake his journey to learn more about why the species was in decline, and to see a living Rusty-patched Bumble Bee in the wild. Sam Droege of the USGS Native Bee Inventory and Monitoring Lab has put native North American Bees on the map for many members of the general public. A female leafcutter bee carries a piece of leaf into her nest, which she'll use to construct a chamber for her young. Hunt's Bumble Bee in a community garden, Bozeman, Montana. Many bumble bee species like this one have bright orange patches on their abdomen, so they are often mistaken for rusty-patched bumble bees. 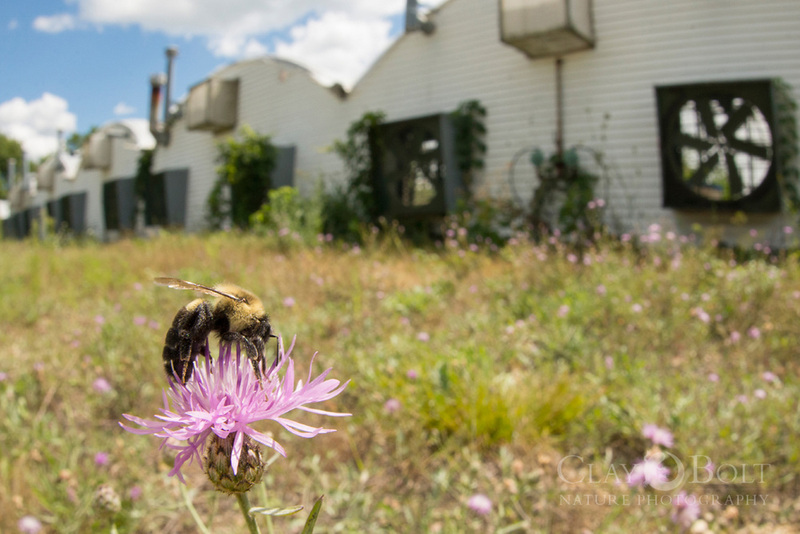 Scientists believe that Nosema bombi, the pathogen that seems to be a driving force behind the rusty-patched bumble's decline, was spread to wild population of bees via greenhouses using commercially raised bumble bees like the common eastern bumble bee (Bombus impatiens), the species being used in this Wisconsin greenhouse. 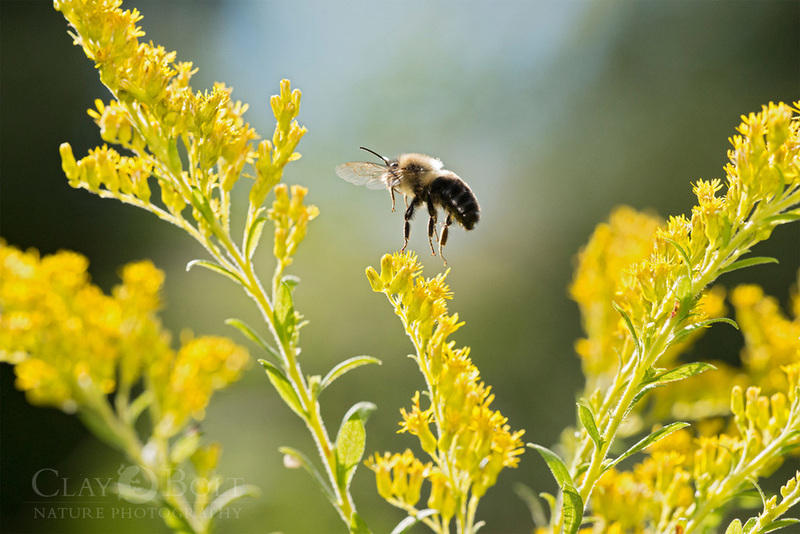 Scientists believe that Nosema bombi, the pathogen that seems to be a driving force behind the rusty-patched bumble's decline, was spread to wild population of bees via greenhouses using commercially raised bumble bees like the common eastern bumble bee (Bombus impatiens). It is easy for commercially raised bees to escape from greenhouse vents and mix with wild bees on the outside. Biologist Jeremy Hemberger carefully applies a very small RFID tracking device to a common eastern bumble bee (Bombus impatiens). This device will provide valuable information about the duration of the bee's foraging trips away from the nest.